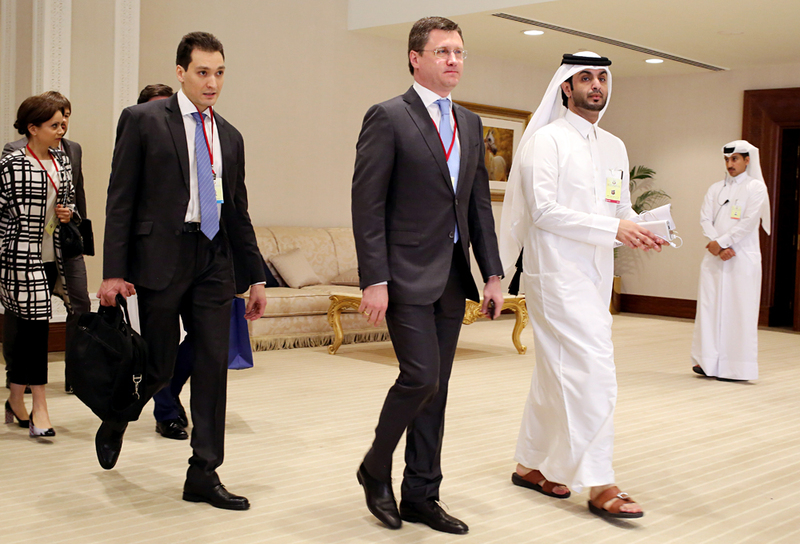 Russian Energy Minister Alexander Novak, center, arrives at an oil-producers' meeting in Doha, Qatar, on Sunday, April 17, 2016. Talks between the world’s crude oil exporters remained inconclusive earlier this week. However, the previous two months have seen verbal interventions send oil prices up, while some fundamental factors have revived demand for crude. The world’s leading oil producers could not reach an agreement to freeze crude output during talks they held in Doha on April 17. Russian analysts, however, insist that the meeting could not be considered a failure as the results were predictable. Global commodity exchanges barely reacted to the meeting in the Qatari capital; oil prices fluctuated within the daily margin of error and averaged $41 per barrel. "This means that the results of the negotiations did not give clear guidelines to the market, [therefore,] speculators will no longer react strongly to such meetings in the future," said Alexander Pasechnik, head of research at the National Energy Security Fund. Oil prices will fluctuate at around $40-45 per barrel in the near future, he said, and this price range is quite tolerable for the Russian budget. Why has oil risen from the bottom? Oil prices have just reached a tolerable level for the Russian budget in the last two months, as the Qatar meeting was being prepared. Discussions on the possibility of freezing production levels for key exporting countries began in mid-February. Since then, prices have begun to steadily increase from $32 per barrel on Feb. 16 to $44 on April 12. However, fundamental factors have had their effect as well, said Pasechnik, pointing out that investment in complex projects (shale oil and shelf development) have been postponed, which already sets a limit on oil supply. Also, the period of low oil prices has sparked demand. China, for example, raised the bar on oil imports in the first quarter of this year, which also stimulates global demand. "Taken together, these factors have reduced the effect of overstocking, which was experienced by the market in early January (2 million barrels daily were surplus). These surpluses have decreased by now," said Pasechnik. What factors will affect oil in the future? “The oil market may be in turmoil, since there are three other unpredictable factors, which affect the price," said Sergei Pravosudov, director of the Russian National Energy Institute. A group of 17 oil-producing countries, including Russia and Saudi Arabia, held talks in Doha on April 17, in an attempt to agree on freezing raw crude output. An agreement could not be signed because of the Saudis, who demanded that the document be signed by all OPEC countries, including Iran and Libya. This is impossible. Ahead of the talks, Iran once again confirmed that it intends to raise production to the pre-sanction level of 4 million barrels per day, while Libya has no control over its oil production.